Live sawing is one of the most efficient ways to saw logs into lumber, and it can also be referred to as slaw sawing or through and through sawing. Each plank is cut straight off the log in one direction without changing the orientation of the log. Live sawing produces planks or boards with angles of the logs rings or ‘grain’. Live sawing is usually the quickest and easiest sawing method, making it popular among novice saw operators. Live sawing is generally recommended for lower quality wood. Cant sawing involves first cutting the across the top of the log before flipping the log 180 degrees to saw the second cuts across the opposite face of the log. Following this, the log is rotated 90 degrees to saw the third side and another 180 degrees to saw the final side. This produces a centre piece called a ‘cant’ hence the name of this sawing method. Cant sawing is generally used on low to medium quality timber. Plain sawing is also referred to as ‘flat’ saw milling and is an extremely common sawing method today. It’s similar to both live sawing and cant sawing, however instead of leaving the cant as it is, it’s rotated and cut to produce more lumber. Like Live sawing, it’s a great way to produce lumber quickly and relatively easily. Quarter sawing is used for wood where aesthetic appeal of the finished product is very important. The log is first cut into four quarters, with each quarter being cut into lumber separately. Quarter sawing the main log results in a more dramatic and unique grain on the final lumber than other sawing methods. It results in more valuable lumber however produces less lumber than other methods. 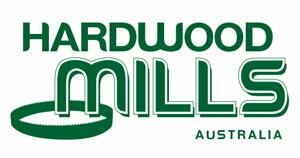 Here at Hardwood Mills, we are one of the leading suppliers of sawmills, blades and accessories in Australia. To discuss your sawmill needs, give us a call or send through an email today for a friendly chat with one of our sawmill experts!